Knowledge acquired through sense perceptions lodges itself in the brain as an encoded variable. While research has until recently proved encoding and the retrieval of information is highly predictive of the specificity of probability, it is also highly likely that knowledge transfer happens on the level of broader and more abstract representations. In the reception of art, the observer unconsciously exercises the redintegrative functions of analysis and interpretation. 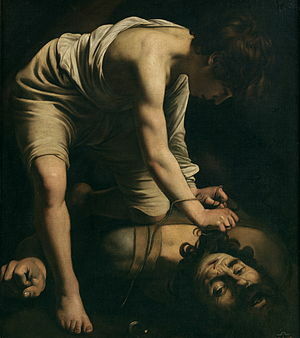 Caravaggio is known for his numerous paintings of David and Goliath, and each one is a permutation after the other. They are all in some ways very similar and in others very different. In order to understand the currents of both knowledge and emotions transferred from one painting to the other, one must first acknowledge the standard knowledge recounted in the Hebrew Bible to distinguish between what new information you can find and which features have survived the process of stimulus selection. A curiosity of the 1599 rendition of David and Goliath at the Prado in Spain is that the painting is fraught with ambiguities, as if the conception were not clear. Somehow we are confronted with a situation of cognitive truth but also optical fiction. What is noticeable in this painting, as well as the 1610 rendition in the Borghese Gallery in Rome is the emphasis on David’s body and facial expression or lack thereof, as well as Goliath’s head. The rest of the painting is suffused in a dark background so thick it is a near material substance. In the Bible, there is actually no description of David other than his body, for which we know his boyish body and also his character, triumphant and naively confident. It seems that as Caravaggio worked on the theme again in his life, that picture became more clear and defined: a young man taking pleasure and satisfaction in his unlikely conquest. In neither painting does he really make Goliath’s face of that much interest. But that obscure and mysterious background looms behind the figure as if about to engulf him were it not for the brightness of the light that casts him into relief. By such comparison, we can see that each time you take a topic of representation and work on it in intervals of time or changing contexts, you can begin to decode its underlying message. This message is lodged in the unconscious and can be discovered through the effects of permutation and variability. Both pictures and words, even music, offer a medium to explore this domain or thought patterns of high redintegrative value. Scholarship on motivation, cognition and emotions has shown that if the process continues to seek fulfillment and reward, the cycle will be regenerative. With that expertise and growing ease in a learned skill, the path of discovery continues to renew itself.